Jesse Newman and Jacob Bunge reported in today’s Wall Street Journal that, “Broker Pat Karst thought the farm being auctioned late last month would be scooped up. The 98-acre plot was of decent quality, and the volunteer fire station in Arlington, Ind., where his firm was holding the sale, was packed with farmers. “Instead, the evening ended with the latest in a spate of failed auctions, after the top bidder dropped out far below the asking price. ‘The moral of the story is: unrealistic expectations from sellers and more caution on the side of the buyer,’ said Mr. Karst, who acknowledged he, too, thought the property would fetch a higher price than offered. The Journal writers explained that, “Now there is mounting evidence the boom is fizzling out. Farmland prices in Iowa fell 3% over the second half of last year, and those in Nebraska fell 1%, according to estimates from the Farm Credit Services of America, an Omaha, Neb., lender that calculates weighted averages based on land quality. Reports from U.S. Federal Reserve Banks across the Midwest late last year showed prices flattening or slipping from the previous quarter. A monthly survey of Midwestern lenders by Omaha-based Creighton University in January found the outlook for farmland and ranchland prices was the weakest in more than four years. “Despite the falling property values, agricultural analysts say a repeat of past farm-belt collapses is unlikely. Farmer income is expected to remain strong and debt levels are low, according to USDA figures” [see related graph]. 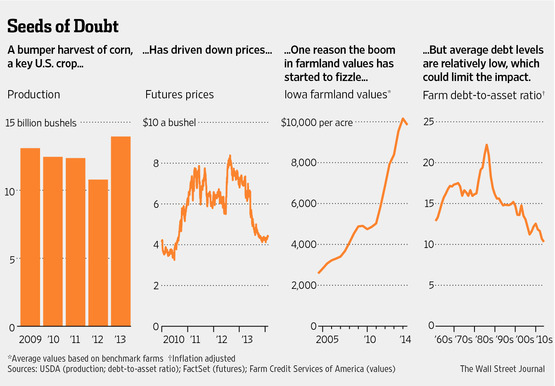 Today’s Wall Street Journal article stated that, “But prices have plunged for corn, a key U.S. crop. After rising to all-time highs in 2012—driven by growing demand and tight supply because of a historic drought—prices for the biggest U.S. crop dropped 40% last year, thanks to a record harvest of 14 billion bushels. The Federal Reserve warned in January that corn prices, then around $4.28 a bushel, won’t cover farmers’ anticipated cost of raising the crop this year. Prices have since climbed to about $4.40 a bushel, compared with about $8.31 in August 2012.